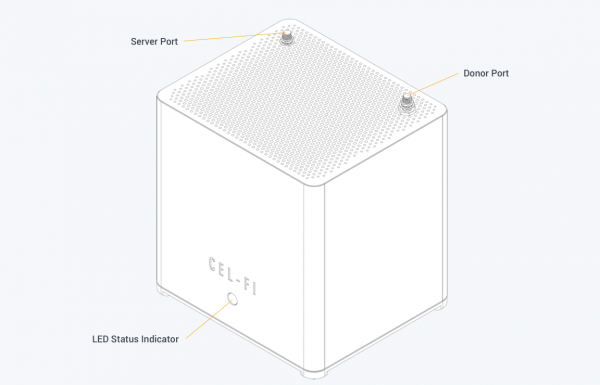 Learn about all the features of your Cel-Fi SOLO. Find the technical specifications for the Cel-Fi SOLO. When your system does not power up, one of the following things could be happening. You could have a power adapter failure, a hardware failure, or the system could need a simple restart. Make sure that your power source is a functional outlet. Test something else that you know works in the same outlet, or try moving the Cel-Fi SOLO to another outlet that you have confirmed has working power. Still Not Working? It is possible that you have a bad power supply or malfunction of your Cel-Fi SOLO hardware. This is not something that should continue, but if it occurs frequently please reach out to your point-of-sale for support. A blinking green status light indicates that your Cel-Fi SOLO is still in the startup process. Depending on the complexity of your cellular network, this process can take some time. If the unit is still blinking after 30 minutes please attempt a restart. This is not something that should continue, but if it occurs frequently please reach out to your point-of-sale for support. If your Cel-Fi SOLO has a solid Status Indicator light in either yellow or green, the system is fully functional. If your system has a solid (non-red) status light but your phone is not picking up a stronger cellular signal you might need to check the server antenna, make sure that your server antenna is fully functional. This is not something that should continue, but if it occurs frequently please reach out to your point-of- sale for support. There are several reasons why your status light would be flashing red. The best way to determine the specific reason for your flashing light is to use the WAVE Mobile application while connected to your device. Learn more about Cel-Fi WAVE. First, you can try toggling airplane mode on your phone near the server antenna, fresh look at the available channels. Also, verify that your phone is compatible with the channels that your Cel-Fi model is boosting (maybe your handset is “unlocked” and actually does not fully support all your current Operator’s channels). iPhones can also show fewer “bars” of signal if the network is heavily loaded. Learn more. There are a few reasons why your phone would experience an issue with the LTE service. You may not have LTE in your area, your Cel-Fi system may have lost the LTE signal due to intermittent network outages, or your phone may not support LTE. Check to see that your phone shows an LTE signal in the location of your donor antenna. Cellular systems are protected assets of the Network Operators that own them. Many boosters in the market cause problems for those networks (which means all of us using the networks too). New FCC/Operator approved boosters are better and don’t cause problems, and Cel-Fi is the only booster in a special class of boosters that allows 100 dB of signal gain (30dB or 1000x the gain of all other boosters). If you have no bars, your unit may still be trying to find the cellular network. Your unit may display a blinking green power indicator, this can sometimes take more than a few minutes. If you have bars of service on your phone at the location of your donor antenna but not at the server antenna, after 60 minutes try a simple restart. To restart your unit simply unplug it for few seconds and then plug it back in. If the restart does not solve the issue please reach out to your point-of-sale for support. Cel-Fi signal boosters are Operator specific, and will only boost one Operator’s channels at a time. Being Operator specific is one of the main reasons that we are network safe and can provide 100dB of signal gain, and why we are the only signal booster approved by a growing number of Operators. Your Cel-Fi SOLO is experiencing a hardware failure. Reset your system by simply unplug your Cel-Fi SOLO from the power source for a few seconds and plug it back in. If you recently updated the software of your device, try again. If the error persists, please contact your point-of-sale for further assistance. Your Cel-Fi SOLO is overheating. Please ensure that your Cel-Fi SOLO is clear of any blockage. If you have your Cel-Fi SOLO in an exceptionally warm area, you may need to relocate the device to ensure that the unit does not continue to overheat. Once Cel-Fi SOLO has cooled it will operate as normal. *Normal operating temperature of the Cel-Fi unit is 0-40ᵒ Celsius. Before use, you must register this device and have your provider’s consent. You must operate this device with the approved cables as specified by the manufacturer. Systems can be registered with the Cel-Fi WAVE application. Your Cel-Fi SOLO unit is experiencing a hardware failure. Reset your unit by simply unplugging your Cel-Fi SOLO from the power source for a few seconds and plug it back in. If you recently updated your device using Cel-Fi WAVE, try again. If the problem persists, please contact your point-of-sale for further assistance. Your system has been disabled by the mobile network operator. Contact your point-of-sale for further assistance. Your Donor Antenna is too close to a cellular tower. This may result in reduced output power (smaller coverage bubble) to limit network interference. Try to move your donor antenna to another physical location. Your system has been moved from its original address. Please move the system back to its original location or register your new address with your wireless provider. Systems can be registered with the WAVE application. During a system check, a part of your unit’s configuration has reported less than optimal performance. The system could be displaying a non-critical error message. If you have a boost in cellular service at your service antenna, you can ignore the E12 message. If you do not have a boosted signal, check to confirm that both your service antenna and donor antenna are properly connected and functional. If the antennas check out, the boost number on the unit is high and you still don’t have a boosted signal, try restarting the unit. If you recently updated the software of your device, try again. If the problem persists, please contact your point-of-sale for further assistance. Your server antenna and your donor antennas are too close together. Try moving the antennas further apart.